So the weather started to finally behave towards the end of April but it still stopped play for our first event which was rained off! Our first outing was on the 4th and at the age of 7 and a bit months Harriet Rose Hollins headed her first competition with Mr Pegs at S&G Weaver Equestrian. 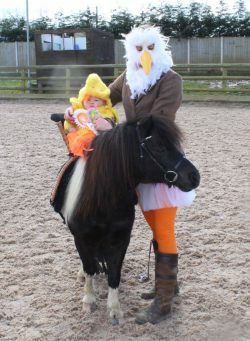 She took part in a fancy dress class as chicken in a basket and I was mother hen. Mr Pegs was beautifully behaved and HRH didn’t cry once. She has her first ever rosette, a 3rd. Thanks to Granny Fishburn for making her outfit the night before the show. On the 7th I headed to Maelor Equestrian for the BRC Area 20 Intermediate SJ qualifiers with Florence, Elfie and Percy. It was a rather hectic day with the most horrendous weather, 7 rounds jumped and a baby in tow, which luckily I was able to palm off on my amazing friends. Elfie jumped two rounds in the 90cm just having a fence down in each round but really jumped well. Florence also did the 90 but made it 3 rounds having jumped 2 clears, to then put in a super speedy jump off to take top spot out of 35 competitors and qualify for the winter championships. HRH had to attend prize giving for me as I was getting Percy ready for the 100cm. Percy jumped 2 fabulous rounds just having a really unlucky 4 faults in the second round. Super pleased with all of them. What a totally fantastic day we had at S and G Weaver Equestrian on16th in the sunshine. It was the last of the winter dressage league and Arrow pulled out all the stops and behaved beautifully for her third ever competition under saddle. We did the Intro C and scored 71.95% for 1st place which also put us in 1st place to take the Intro Winter League. Then we did Prelim 2 and she was impeccably well behaved for 75.51% to again take 1st place and 2nd place in the Winter League. What a super star she has been so far this season. She really loves her work and shows so much potential. I’m so proud of how she has come on and so excited for her future. I finally managed to get my event season under go on the 22nd!!! Percy and I headed to Kelsall Hill for the BE100 Open. Our first event in 11 months having had time out for me to have HRH, it was quite strange heading out to walk the xc course with a baby strapped to my front! Percy was really well behaved in the dressage and I thought he did a really nice, accurate test so was a little disappointed with a 34. On to the SJ and he was rather excited to be there to say the least. He jumped a nice round in slightly sticky going apart from deciding the fence with a wall under it was slightly spooky and needed an extra stride before take off to have a look, causing us to have an awkward jump and a fence down. He was so good across the country, it was like we hadn’t missed a day out on the cross country course, let alone 11 months. And in fact he hadn’t even been xc schooling just because of awkward weather situations. So overall I was super pleased with our first event post Baby Harriet. On 27th I headed to Bury Farm in Buckinghamshire for the BRC Intermediate Winter Championships with Florence, HRH, Granny, Betty and Dolly. HRH’s first overnight stay in Queen Wendy the Wagon. We had qualified as an individual for Weaver RC. Our first round on the Saturday didn’t entirely go to plan, which may have been due to a slight jockey error. I had walked the course in the morning and hadn’t realised until I rode the course how tight fence 3 was off the wall and having turned in to it was just a bit like “oooooh” which is a big no-no with Florence who can read me like a book and before I had time to correct her she’d glanced off it. She proceeded to pop round the rest of the course but we did have a rail as I was probably chasing her a bit after our whoopsie – #sackthejockey! In our second round she sailed round making nothing of it at all for a clear round. An expensive reminder that with Florence everything needs to be forward and positive, no time for questions. We ended up 37th our of 98 competitors even with our 8 faults. Only 5 were double clear. Ever so slightly kicking myself the 135 miles home. But onwards and upwards to May we go, fingers crossed for the weather to keep behaving. Scroll through my photos in the gallery below.